Ah, the memoirs. A genre I have enjoyed, possibly ever since I read Roald Dahl’s delicious recount of his childhood, Boy, in the fifth grade. I read quite a few of them this year, and this and the posts that follow will feature my favorites. That being said, I didn’t particularly want to like The Glass Castle. I heard it was a very good book, and it was on many of those lists of Great! Books! Everyone! Should! Read! but while I enjoy memoirs, I’m not entirely enamoured with the whole “my childhood was weird and mostly rotten so let me write about it.” Yes, I liked Running With Scissors, but I liked Burroughs’s other books better. I couldn’t bring myself to finish The Liar’s Club. But with The Glass Castle, I didn’t entirely realize I was reading this particular subgenre until I was sucked in. 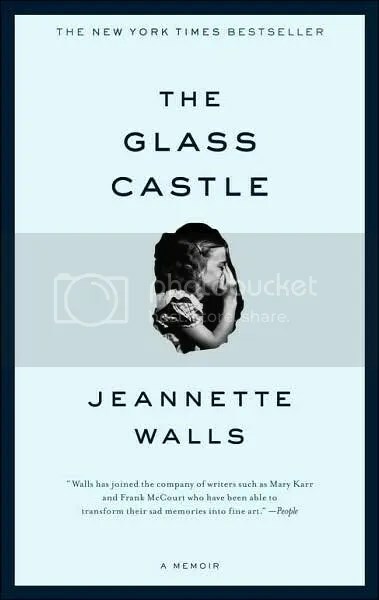 Jeannette Walls was an adventurous and tenacious child, inventing not only games to entertain her and her three siblings, but to survive as well. Her parents, Rex and Rose Mary were loving and creative and free-spirited, instilling the American ideals of ingenuity and self-reliance, but things like paying the bills and putting food on the table fell second to painting, writing, or planning a machine to pan gold. The Walls’s lived on a shoestring, and moved whenever creditors caught onto their various debts. Each chapter of this book is a story unto itself, and each story is told with a suprising amount of warmth – you would think that the child of parents who couldn’t provide three square meals or a heated home would harbor some resentment, but Jeannette seems to almost accept her parents’ limitations. However, this is truly the story of Jeannette’s exodus from the family, how she rose to her own life and career despite all her parents did to hold her back. Buy this for: Fans of the aforementioned Running With Scissors or The Lia’r’s Club, or teenagers who think their parents are JUST AWFUL OH MY GOD I HATE THEM.